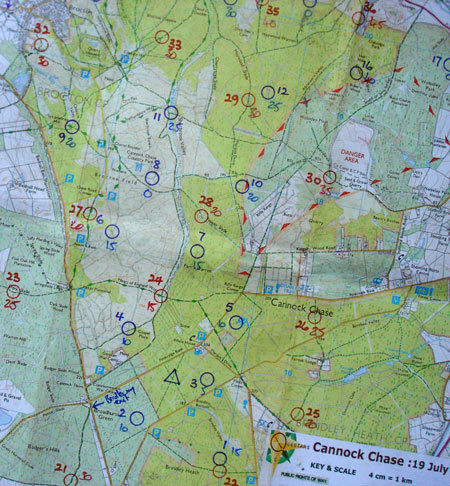 It’s a good few years since I rode in Cannock Chase Forest. In fact, I was on the Pace which dates it a bit as I’ve been through quite few bikes since then. I remember a bewildering array of singletrack – paths cross-crossing open moor and darting in and out of birch scrub and conifer forest. Easy to get lost if you weren’t paying attention. The perfect place to have an orienteering event then. Specifically, Round 3 of the Quest Adventure Race Series. Round 1 didn’t even feature on my radar, Round 2 was in Brecon the week after Henry was born so I had my hands full. My mate Alan did the Brecon event solo, and having had a really good time, persuaded me to join him for the Cannock Event. Following a very similar format to Polaris whereby you navigate to various checkpoints within a specified time limit, it mixes the disciplines of mountain biking and running. The biking obviously being our strength, we headed out on a mission to get all the bike points available. With a few navigational errors along the way to counter some really slick navigation through bits I knew, the checkpoints began to fall pretty quickly. There was a specific transition area for the running in the forest some distance from the start/finish, which we arrived at after 2.5 hours. We’d ridden pretty hard and accumulated a good points tally already. The legs felt pretty good going into the run, but it wasn’t long before the undulating nature of the forest (read as: everything felt as if it was uphill) began to wear us down. With seven of the 18 running checkpoints tagged, we got back to transition with enough time left on the clock to pick up the remaining bike checkpoints. It was good to be back on the bike after an hour and half of running, but my legs defintely felt heavier than they did before the run. A puncture 20 minutes before the end cost us the extra time we needed to get the last fiddly bike one, so we rolled into the finish with 7 minutes remaining of our 5 hours. With 615 points on the board, we were hopeful of good placing. We waited tentatively at the prize giving only to discover we’d posted the highest score! Cool. Overall, it was a superb event – well organised and very friendly. Still slightly stunned we actually won our category, but extremely chuffed. Roll on the next one: Round 4 – Isle of Purbeck.